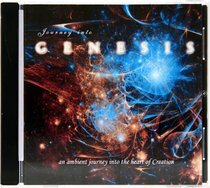 Customer Reviews For "Journey Into Genesis"
This collection of ambient instrumentals held with gentle vocals was inspired by the magnificent beauty all around us - given freely to us as a gift from a generous and amazing God-for our enjoyment and replenishment. This cd is creatively unique, taking the listener into a journey into Genesis - through expanse, light, land and sea..great mountains, interchanging from the sounds of the whale in the voice of the deep..to the violin, Irish whistle to the flute and saxophone...bringing with each track a surprise at every turn along the way. We hope you will more than enjoy, but bask in His beauty and hear His heart for you.